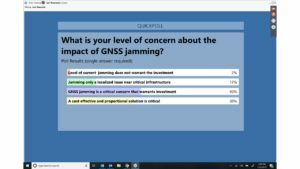 Rohde & Schwarz sponsored an Inside GNSS webinar today on “GNSS Jamming and Crowd Sourcing Detection and Geolocation.” A poll at the end of the webinar showed 82% of the 450+ participants supporting action to counter jamming. The event proved an interesting mix of technical and general information on the topics. Early in the program Sherman Lo from Stanford pointed out that some crowd sourcing was already being done. 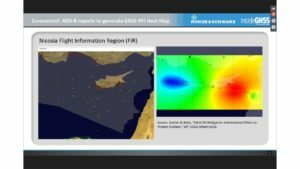 The use of ADS-B information to detect interference in the vicinity of Cyprus is an example. It could also easily be done using cell phones and/or installed network devices. Frank van Diggelen from Google provided a lot of information about apps for Android phones that allow users to detect GNSS interference. We particularly liked that you could test the app by holding your phone next to the door of your microwave while it is operating (as Frank says, GNSS signals are so faint, pretty much ANY in-band signal will jam them). Stefan Maier from Rohde & Schwartz rounded out the presentations by discussing various architectures that could be used to incorporate fixed and crowd sourced interference detection information. We are glad that he discussed Europe’s outstanding STRIKE3 interference detection project. If anyone is skeptical about the amount of jamming out there, they just need to check out one STRIKE3’s presentations. 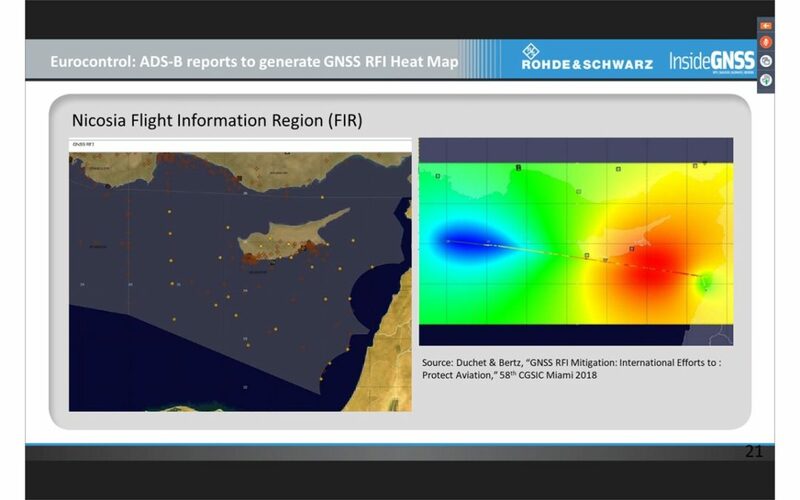 The webinar made it pretty clear that the technology exists to leverage both cell phones and fixed infrastructure to easily detect and geolocate GNSS interference. This reinforced similar points made by industry presentations at the US PNT Advisory Board’s last meeting. 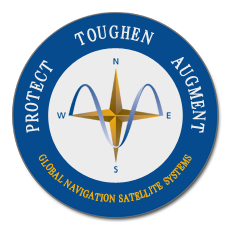 Still open, though, is the question of whether anyone, specifically anyone in government, would use the information in such a system to reduce the amount of GNSS interference that is out there.